Sen Guesthouse<br>セン ゲストハウス<br> Shodoshima —Tai-Meshi (Ehime’s regional specialty food) restaurant, 5 mins away!! Tai-Meshi (Ehime’s regional specialty food) restaurant, 5 mins away!! Located a mere 5 minutes from Dogo Onsen, and right down the street from our guesthouse, Daikokuya is an amazing place to discover Ehime’s regional speciality, tai-meshi. Tai (snapper)-meshi can be served several different ways. Ehime’s specialty version of tai-meshi is snapper sashimi served over rice. Daikokuya has a unique take on this tradition, tai no kama meshi. Kama meshi literally translates to “kettle rice” and is a traditional Japanese rice dish cooked in an iron pot called a kama. Daikokuya has many varieties of kama meshi ; but believe me when I say it, the best by far is the snapper (tai) kama meshi. Founded by Murakami Kazuo and a throng of housewives in 1977, the flavor of both the udon and tai-meshi at Daikokuya is sophisticated enough for the Tokyo salaryman yet simple enough for the stay-at-home mother. 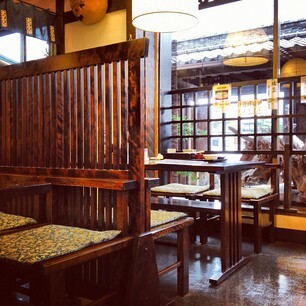 The interior is well-designed and tasteful, featuring both tatami areas and normal chairs and tables. The prices are very fair; for a huge tai-meshi, set, including tempura, udon, egg porridge, pickles and tea, it’s a cool ¥1300. For just the tai-meshi and udon it’s only ¥880. Upon walking into the establishment, one is met with calls of greeting from the very attentive and knowledgable staff. You will be immediately drawn to the traditional Japanese artwork and shamisen music playing in the background. To complete the package, at the front of the restaurant is a beautifully designed Japanese garden replete with stone lanterns, a water mill and hanging moss. It is about a 20 minute wait for tai no kama meshi, but it is well worth the time spent. If you order a set, they will serve the udon and/or other dishes as appetizers which provide a nice warm-up for the main event. When the kama is set before you and you take off the traditional wooden top, you immediately realize you are in for a treat. The beautiful rainbow color of the snapper is graced with only the smallest amount of mitsuba (Japanese herb), which is all placed on top of rice. I definitely wonder how so much flavor can be brought out of so few ingredients. It seems every grain of rice is infused with the delicious flavor of snapper. A must visit if you are in the Dogo area of Matsuyama.